The topic and practice of mindfulness has made its way into all healthy living circles, including kids and parents. And frankly, it makes me happy. I first learned about it as a therapist trainee and thought it was best thing since sliced bread (I lie, I thought it was the best thing since grilled cheese, I’m a big fan of grilled cheese). There are many definitions of mindfulness. I like Jon Kabat-Zinn’s the best. The Mindfulness-Based Stress Reduction Model creator says, “Mindfulness is awareness that arises through paying attention, on purpose, in the present moment, non-judgementally. It’s about knowing what is on your mind.” Engaging in mindfulness exercises has a host of benefits, such as improving coping, emotion regulation, anger management, and reduction in mental health symptoms. Are you wondering how simply paying attention to the present moment, can help parents and kids? Don’t worry, I was a skeptic too. Studies show that the consistent practice of intentionally paying attention non-judgmentally (simply replacing judgment with facts or removing labels such as bad/good) helps us with the way we perceive things, allows us to accept reality in the present moment, increase emotion regulation and most importantly, differentiate ourselves between our thoughts, feelings and our actual being. In short, we are not our thoughts. We are not our feelings. They’re simply an experience we’re having in the present moment. Everyone can relate to this regardless of age. 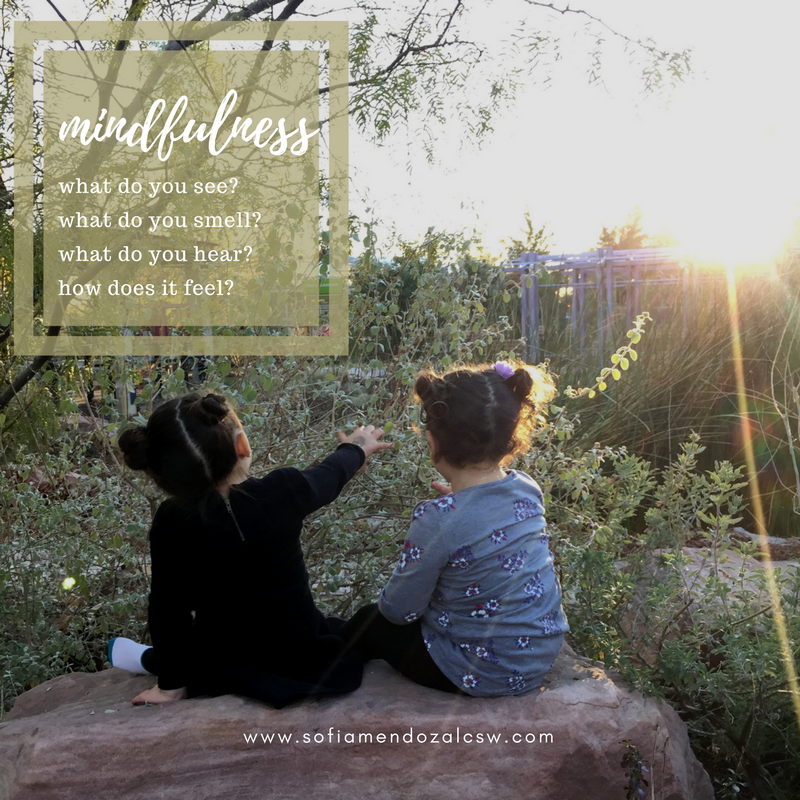 So how do we teach kids to be mindful? First of all, babies are the experts of being mindful. They have what’s called “beginner’s mind” where they actually use their observe skills more than anyone. They use their senses (sight, hearing, taste, touch, smell) to navigate and learn about the world. In mindfulness, we’re striving to use those skills from that beginner’s mind. Through the years, language, judgment and distractibility, we’ve seemed to have strayed away from, but can learn to bring back and use them to cope with daily challenges. Mindfulness of emotion can help with observing, identifying and managing difficult emotions. I just recently came across this awesome book, “I can handle it” by MS Laurie Wright that focuses on a boy who experiences lots of disappointment and other challenging emotions. He labels his emotions and comes up with different ways to tolerate and cope with the feelings. Being able to observe ones emotions is key in mindfulness and any healing practice. We can’t understand and emotion if we don’t know which one it is! I like this book because it teaches kids that it’s ok to have feelings, it’s how we manage it that matters. This book has lot of great and silly examples that my almost 4 year old loved. 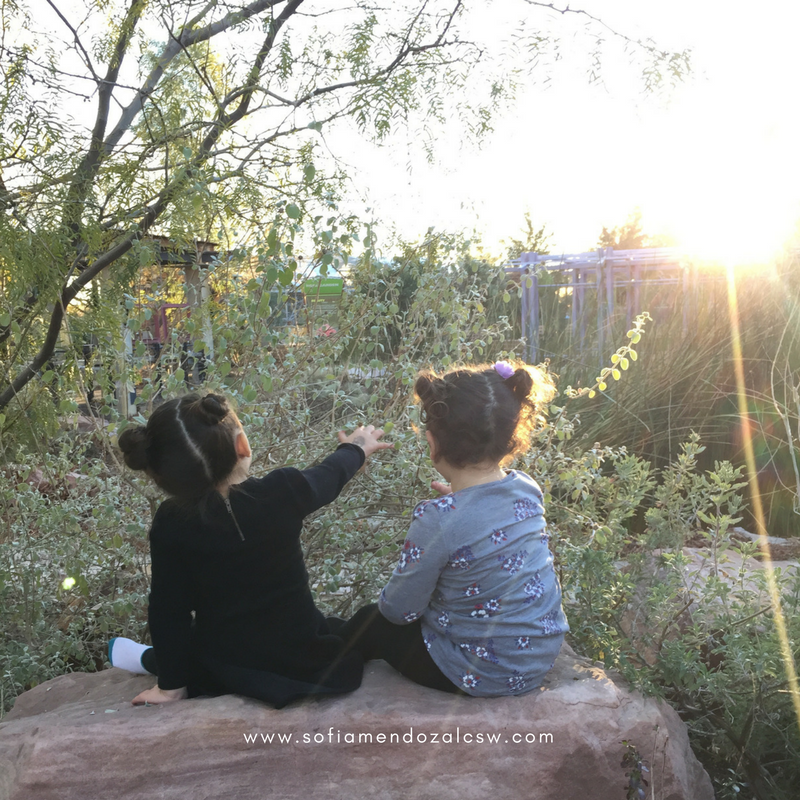 When my daughter shares an emotion with me, I’ve started to ask her, “where do you feel it in your body?” We’ve turned it into a game with curious nature about these “funny body sensations” we all have. 2. Mindfulness of Breathing is another common practice in mindfulness as it helps the person anchor on a physical sensation. Since we’re always breathing, that’s perfect to chime in to and when we drift our attention to other this (super common, by the way), we always have our breathing to anchor us back into the practice of focusing on one thing in the present moment. Our breathing can tell us a lot about what’s going on in the moment. The more we can focus on our breathing, slowing it down and into our belly, the more we will notice the intensity of the emotion changing. I love this video of students of Citizens of the World Charter School, in Mar Vista, CA. It’s a great visual of the practice of mindful breathing to cope with emotions. One can’t help but breathe when watching these kiddos. I love how they talk about emotions and their triggers too. It’s a great way to validate their emotions. 3. Belly (Deep) Breathing is another wonderful skill that helps with mindfulness and relaxation. My favorite way to teach kids how to take deep breaths is by engaging them blowing bubbles. First, I have them blow bubbles regularly. You know they are breathing into their chest when it’s hard for them to form bubbles. Many times, I have to teach them to slow down. Then I have them breathing into their belly so they can make a big bubble. The bigger the bubble, the more they have to slow down and engage their diaphragm (which is linked to slowing down heart rate). Sesame Street has a great video where Elmo, Common and Colbie Caillat sing about using belly breathing to manage anger. It’s another video I have on my mindfulness playlist for kids. 4. Compassion practice is essential to manage judgments toward self and others. A lot of challenging thoughts and feelings are related to unworthiness, unlovability, excessive guilt and judgments. Kids experience these thoughts and feelings too. I love the Buddha’s Apprentice at Bedtime series by Dharmachari Nagaraja because it has stories that focus on compassion, kindness and using their internal wisdom. Stories also help with concentration, paying attention to details, and a great way to help calm down before bedtime. I wish you more by Amy Krouse Rosenthal and Tom Lichtenheld is a great book on wishing loved one “more” positive than challenging moments. 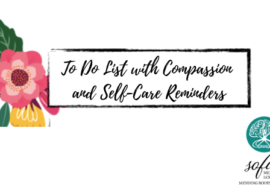 A lot of times, we don’t know how to help others when they’re struggling and unintentionally resort to withdrawing from loved ones when they need us to just be compassionate. This is a great way to introduce well wishes for kids who might have people in their lives going through tough times and even for us adults to remind us that although we can’t change or fix the problems in our loved ones’ lives, we can definitely use compassion-based thoughts and wishes. 5. Gratitude practice is a great way to focus on the positive that’s happening in the present moment. Whether it’s food, shelter, or togetherness, are all strengths that we can acknowledge and be thankful for. In no way is this meant to trivialize or invalidate ongoing struggles, it’s a practice that can help focus on the silver linings in our lives. Modeling is the best way for kids to learn gratitude practice, so simply sharing with your kiddo what you’re grateful for can open up the space for them to do it too. Doing it before bedtime can help with calming anxieties and promoting sleep. 6. Practicing being in the present moment with anything! Mindfulness is like a muscle we’re building. The more we exercise it, the stronger the muscle will be. Mindfulness is about using full awareness using our sense: sight, smell, hearing, touch, taste in the present moment. You can do it by simply observing flavors, smelling scents, focusing on the different colors around you, counting, drawing just to draw, and as you notice distractions or judgments, just notice them and come back to the task or present moment. Having kids describe what they see in nature, while on the road, or even what they see in the sky can be help them stay present in the moment with what’s around them. Sitting Still Like a Frog is one of my favorite mindfulness resources. It comes with a CD (yes, I still use CDs). I use many of the creative exercises in the book, but mainly the guided mindfulness exercises on the CD. Even my adult clients love the exercises I play for them before starting session. It’s a wonderful way to start or end the day, task or moment. In one of my therapy consultation teams, we start with a different mindfulness exercise and I really helps provide clarity, and set the tone of intentional attention for the meeting. I encourage you all to do the same. 7. Videos. Youtube Playlist. You can make a youtube playlist of your favorite guided videos to encourage guided visual mindfulness practice. Here are some of my favorite videos on my mindfulness playlist (these are actually from my daughter’s “Bedtime” playlist). 8. Apps. Maureen Healy wrote a wonderful article on Psychology Today about 5 different apps you can use to encourage mindfulness in kids. I could go on and on about this topic as it’s very near and dear to my heart. This is not an exhaustive list and I hope to keep writing about it. Just remember, as long as you’re can practice intentionally bringing your attention back you’ve succeeded! Keep building that muscle and it will get easier with time. 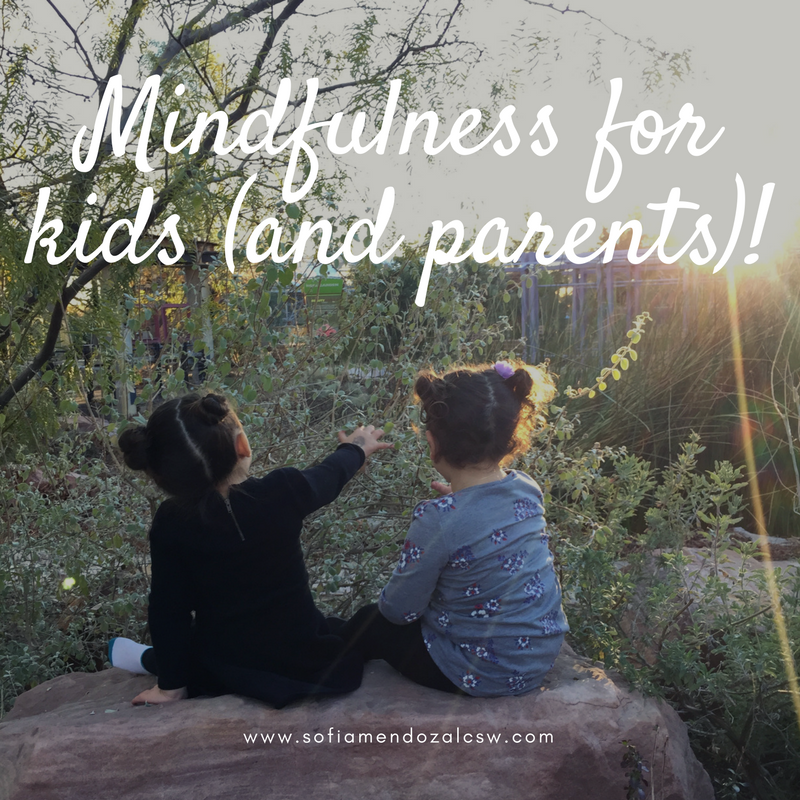 What are your and your kiddos’ favorite mindfulness practices? Disclaimer: I am a participant in the Amazon Services LLC Associates Program, an affiliate advertising program designed to provide a means for me to earn fees by linking to Amazon.com and affiliated sites. You should also know that I stand by my recommendations as I read or use everything I recommend. The fees earned from Amazon.com go toward purchasing more books and materials used in my practice. This is such great information! Such a hands-on way for parents to teach (and learn) mindfulness. 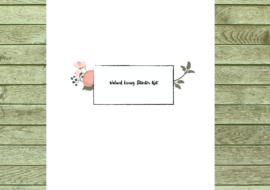 Thank you for this awesome blog post! I love these tips and the books and videos you provided! So helpful! I’m all for the gentle parenting approach! We have “I can handle it” it’s one of my favorite books. It has helped my children so much (and me as well). Great post and so many helpful tips! We are big fans of the cosmic yoga. I’m defiantly going to check out some of the book recommendations. Thanks for sharing! Love that being intentional with our kids & present is becoming the “it” thing! Great post with anLOT of resources on helping accomplish this connection & presence. Thanks for sharing! You are absolutely correct, we should practice on mindfulness and gratitude as a family. Amazing post, I have been trying to practise mindfulness for quite some time along with my kid and there were many points I loved here. Shall try reading “I can handle it” book. LOVE THIS!! Mindfulness is so, so, so important in both adults and children. Thank you for recommending the book and videos, I will be checking them all out. This is such an inspirational post. Would love to practice these things in my day to day life. I am really working hard at helping my kids identify their feelings and emotions. I want to give them the tools to be able to manage feelings and triggers. This is a wonderful information and totally helpful tips. I believe in gentle parenting and also practice it.